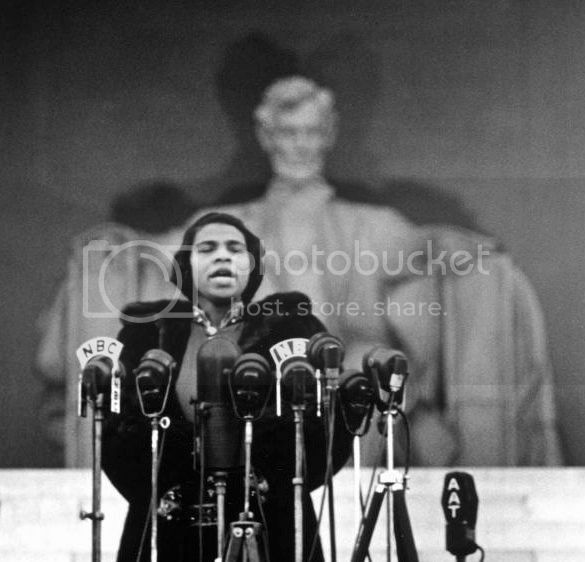 On April 9, 1939, Marian Anderson gave a concert at the Lincoln Memorial after the Daughters of the American Revolution refused to allow her to perform at Constitution Hall because she was black. The Easter Sunday concert drew a desegregated crowd of 75,000. NPR ran a story about the event this morning. But her change of lyric — from “I” to “we” can be heard as an embrace — implying community and group responsibility. Never a civil rights activist, Anderson believed prejudice would disappear if she performed and behaved with dignity.